A overview and discussion of toe sprains in the dog. The toes are typically the point of surface contact for the dog’s body and play an important role in locomotion and structural function. 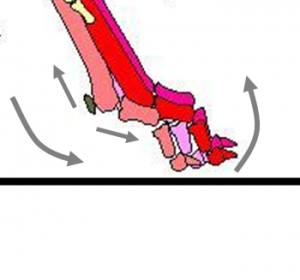 The distal limb is exposed to many traumatic events as a result of it’s almost constant interaction with the ground. The toes of the dog are typically the body’s point of contact with the surface. The distal limb is defined as the anatomical structures from the carpus/tarsus to the distal end of the front and rear limbs. There are four toes, or digits, that are part of the dog paw. Dew claws are the toes (mostly seen on the front legs and sometimes in the rear leg) that are similar to the thumb in the human and have a minimal role in surface traction. They are numbered from medial to lateral (inside to outside) beginning with the dew claw: I, II, III, IV & V. The most medial toe of the paw is Called Digit II and the most lateral is Digit V. In the distal limb, the skin has minimal muscle and fat under it for cushion. Injuries are not rare to these structures and the author of this document has a great deal of experience in treating and managing these types of injuries. There are three bones that make up each dog toe: Phalanges 1, 2 & 3 also referred as P1, P2 & P3. 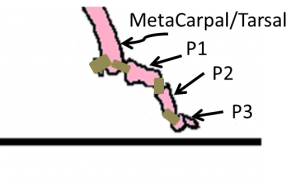 P1 attaches to the end each Metacarpal or Metatarsal bone. At the distal end of the metacarpal and metatarsal bones on the on the posterior side are two bones called sesamoids. The space between the phalangeal bones is the joint.  The joints are named the MC/MT-P1, P1-P2 and P2-P3 joints. Ligaments are the tissues that connect each of the bones at the joint. There are also ligaments that attach the sesamoids to the end of the metacarpal/metatarsal bone. Bones (P1, P2 & P3), joints & ligaments of the dog toe. The ends of the bones in the joint are covered with a hyaline cartilage. This helps to provide a cushion and reduces friction between the two bones. The joint is covered with a fibrous tissue with a synovial lining which is called a joint capsule. This lining produces synovial fluid that also helps to reduce friction. When the joint capsule is strained or disrupted, it affects and sometimes changes the contents of the synovial fluid. This will also cause an inflammatory affect in the joint capsule. This results in a swollen joint. A cranial view of the Toe (Digit) showing the two joints and the ligaments that hold the bones in place. The joint is surrounded by a synovial structure called joint capsule which is filled with synovial fluid. If the strain is great enough, it may affect the status of the joint ligaments. A Grade 1 sprain will show as subclinical or mild lameness. The joint will appear to be stable on joint manipulation. A Grade 2 sprain will present as a sudden onset lameness and later show as a swollen joint. In this case the joint can be physically displaced on palpation but will pop back in place. A Grade 3 sprain will exhibit as varying levels of lameness with a swollen joint. The joint may be displaced on examination or if displaced on examination, will stay displaced and not pop back in place. This can occur in both the proximal and the distal toe joints but is most common in the P1-P2 joint.  Grades of tissue disruption of the joint capsule and ligaments. Grade 1 Sprain – Synovia & Ligament are intact. If the ligament is stretched, the joint can be loose and the joint may be predisposed to future injury. Usually conservative management will suffice. It is important to remember that the toe is always being stressed on paw contact and during the stance phase of every step cycle, so a splint may benefit in the recovery. This injury has a good prognosis with conservative management. Grade 2 Sprain – Synovia is intact but the ligament has significant damage or is fully ruptured and the joint is unstable. Treatment will need to include some sort of stabilization. Usually Surgery or Prolotherapy (Sclerotherapy) is needed to stabilize the joint. The prognosis is good if treated and poor if untreated or treated conservatively. Grade 3 Sprain – The ligament/s (either one or both the medial or lateral ligaments) is/are ruptured. The synovial sheeth may also be ruptured. Treatment will need to include some sort of stabilization. Surgery or Prolotherapy (Sclerotherapy) is needed to stabilize the joint. The prognosis is good if treated and poor if untreated or treated conservatively. *Important* It is better not to delay repair in Grade 2 & 3 dislocations. The altered gait can affect the rest of the musculoskeletal structure as the dog will off-load the paw and place altered stressors on the compensatory structures. Toe injuries and sesamoid inflammation are commonly seen in athletic, working dogs and in dogs who are highly active out in the field. In this discussion we address diagnosis, treatment and management of toe sprains. They will create issues that should be addressed. These are injuries are not commonly seen in the general practice setting. If they occur in the pet animal, they may not be seen as significant. The pet may show a slight lameness but nothing to affect its daily lifestyle. Toe injuries have a very good prognosis when managed by a veterinarian who has experience diagnosing and treating these issues. Yore, P., Practical treatments for orthopedic problems in the forelimb. Refresher Course for Veterinarian, University of Sydney, The post graduate committee in veterinary science, Proceedings 64, May 1981.